Shopping for gemstones and gemstone jewelry can be confusing because prices can be very different for jewelry and stones that appear to be similar. Many of the words used in jewelry ads can be confusing, too. Gemstones are labeled as either natural, genuine, synthetic, simulated, treated—or a combination of those terms. If you're unfamiliar with these terms, you can mistakenly buy a stone you thought was "real" but turned out to be a human-made imitation. Let's talk about the differences. Natural gemstones are delivered to us courtesy of nature and have absolutely no interference from humans other than being mined, cut and polished. By the time they appear in our jewelry, natural gemstones will look much different than their original form, but they've not been altered in other more artificial and sometimes misleading ways. Natural should indicate that the stone has not been treated, enhanced or otherwise altered. A genuine gemstone is the real thing much like a natural gemstone. However, the stone isn't natural anymore if it was treated in some way to enhance its appearance. Enhancements allow jewelry manufacturers to improve the look of lower quality gemstones that consumers wouldn't otherwise purchase. Treated gemstones are genuine, but they are no longer considered natural. If naturally "perfect" stones were the only gems available, most of us couldn't afford them. Are All Natural or Genuine Gemstones Valuable? No, a 'natural' status does not guarantee that a gemstone is valuable. Small to large gemstones of poor quality are common and often considered mining castaways. Gemstones can vary in value due to their abundance. Get the facts about a specific gem before you pay a premium price just because it is labeled "natural." Natural rubies of high quality are rare, and demand for the gem is always high. Some of the areas where topnotch rubies are mined are in political turmoil, reducing the supply even more. Compare rubies to red garnets, which are gorgeous, but not rare. A flawless natural garnet costs a great deal less than a ruby of similar quality. A synthetic gemstone shares a natural stone's physical, chemical and optical qualities, but it is created in a laboratory. It's kind of like making a high tech batch of cookies—we know the ingredients, and we know how long to cook them. You'll see synthetic versions of nearly all popular gemstones and many versions have been available for many years. Older synthetics were fairly simple for gemologists to detect because they were often too perfect. Some modern synthetic gemstones look more natural and are harder to identify—ask an experienced jeweler or gemologist to do an inspection. Jewelry that includes quality synthetic gems can be just as beautiful as jewelry made with natural stones. Good synthetics aren't always inexpensive but should cost much less than natural stones of similar size and quality. 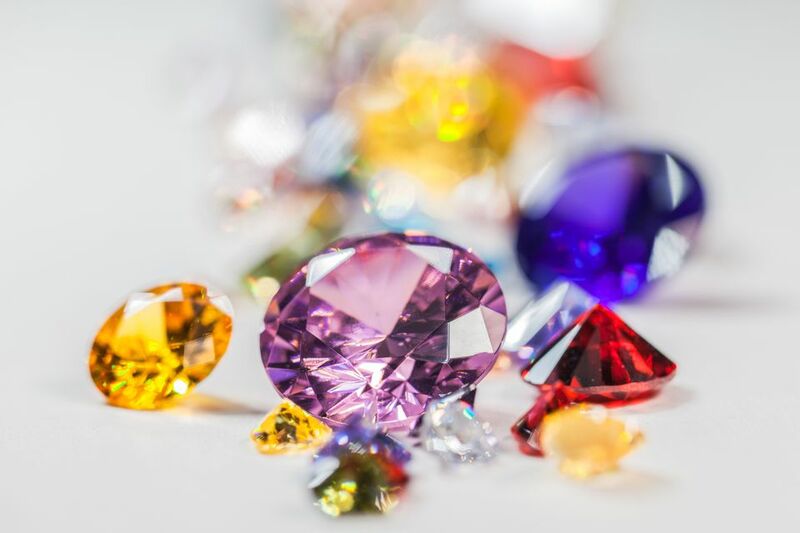 Since synthetic gemstones have the same composition as their natural counterparts, they could technically be called genuine, but that would be considered deceptive labeling if the stone's origins are not disclosed. Question the ethics of anyone who knowingly omits origin information and the expertise of anyone who cannot provide the facts. Unlike synthetic gemstones, simulated stones are in no way similar to the natural stone they are imitating. Their chemical composition is not the same nor are other gem qualities like a refractive index. For example, the popular cubic zirconia would be considered a simulated diamond. These stones have also been around for many years, so don't be surprised if you find a ruby doublet (made with garnet and glass) in an old Victorian-era ring. Buy pricey gemstones from a company or individual you trust, especially if the gems are labeled natural. Ask for verification from a respected laboratory before paying top dollar for any gem. Gemstones that aren't usually treated include garnets, peridot, hematite, alexandrite, and moonstone. Many other gemstones are commonly treated to improve their appearance. Read as much as you can about gemstones and jewelry, and then study ads carefully to compare prices. Ask for details on all components, not just the gemstones. Go shopping locally to compare jewelry and gemstones side-by-side. Good luck!